Representatives from the Department, Florida Fish and Wildlife Conservation Commission and National Oceanic and Atmospheric Administration provided opening remarks. MIAMI– The Florida Department of Environmental Protection’s Coral Reef Conservation Program held a kick-off meeting for the Our Florida Reefs Community Working Groups Thursday evening at NOVA Southeastern University's Center for Excellence in Coral Reef Research campus. The Our Florida Reefs community planning process for Florida’s coral reefs is the largest project to date by the program. The evening was sponsored by The Nature Conservancy, hosted by NOVA and coordinated with partners from NOAA's Coral Reef Conservation Program. “This is an exciting time for the future of Florida’s coral reefs, as evident by this large effort and the generous donation of time by working group members,” said Drew Bartlett, Deputy Secretary of Water Policy and Ecosystem Restoration. The keynote address was delivered by Ellen Prager, Ph.D., former Chief Scientist for the Aquarius Reef Base undersea laboratory at Conch Reef off of Key Largo. Dr. Prager is the author of several books on marine science and served as a faculty scientist at Woods Hole Oceanographic Institution in Massachusetts..
After nine years of collaborative work with more than sixty local partners, working groups will review the collected materials and suggest strategies to maintain the health of the living coral reef adjacent to four south Florida counties. A total of 52 stakeholders were selected through an application and interview process. The members are divided into north and south working groups. The north working group will focus on the coral reef resources offshore of Palm Beach and Martin counties, while the south working group will focus on those offshore of Broward and Miami-Dade counties north of Biscayne National Park. Working group members will meet monthly for a year to review the latest science on southeast Florida’s coral reefs and work together to make management recommendations. The working groups will each begin meeting in February. Public comments can be submitted online throughout the process at http://ourfloridareefs.org/public-comment-form/. 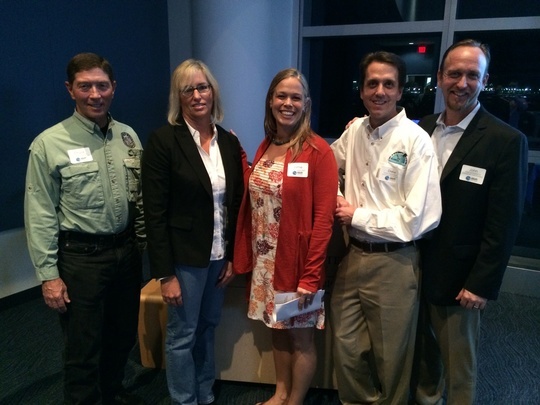 Pictured (left to right) are Chuck Collins of the Florida Fish and Wildlife Conservation Commission, Ellen Prager, Ph.D, Jamie Monty of the DEP Coral Reef Conservation Program, Drew Bartett, DEP Deputy Secretary and Dr. John Christensen of the National Oceanic and Atmospheric Administration's Coral Reef Conservation Program.